Morlock Night is K. W. Jeter’s 1979 sequel to the classic time travel novel, The Time Machine. I’ve always been a little wary of posthumous sequels, and indeed novels written late in an authors life with another (this having read the less than stellar collaborations penned by Isaac Asimov and Robert Silverberg – though that dislike might be as much to do with the fact that Asimov is, well, a bit rubbish anyway). So having not read such an endeavour for some years, I finally relented and gave Stephen Baxter’s own sequel to The Time Machine a go. As I recall, enjoyed it a great deal. While it is respectful of the H.G. Wells novel, it certainly fits in well with the style of Baxter’s oeuvre and I didn’t feel that the weight of the Victorian novel was a leaden weight, dragging Baxter down. Anyway, the point is that I, since reading this, became slightly better disposed to the idea of the posthumous sequel. 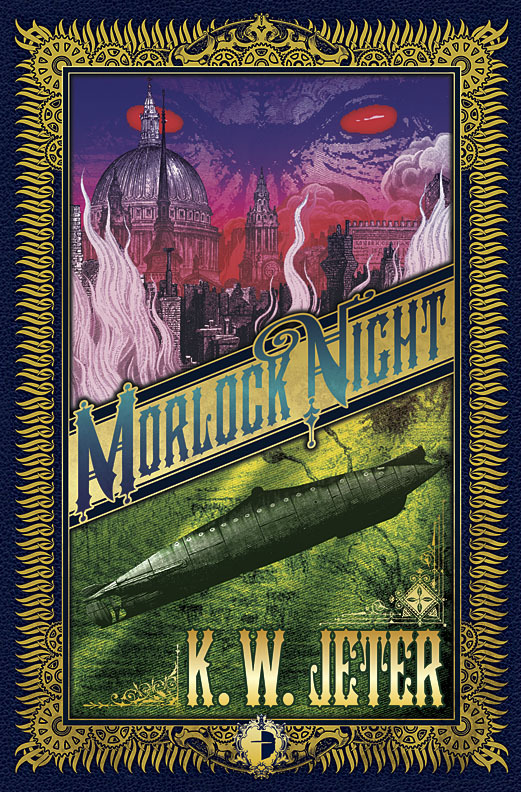 Morlock Night picks up in the 19th Century with Hocker, one of the guests at the time traveller’s house in the original novel, telling his story. At the outset, Hocker is dismissive of the tale he and his companions had been told. He is unable to believe that what he has heard could possibly be true. He learns from the – initially described as ‘Pale Man’, Dr Ambrose that all was not quite as the time traveller had described on his first trip to the far future. Dr Ambrose explains that the race of Morlocks initially encountered by the time traveller, while brutish and of a degraded intelligence, didn’t represent the finest of their species. When he returned, the time traveller encountered the more cultured and intelligent (although it is implied later in the novel that, even with that, they don’t have the technological prowess of earlier generations of people) sections of the Morlock society and lost his life. This led to the Morlocks obtaining his time machine and using it to move backwards in time to conquer humanity in the past. Jeter has it that the time traveller nipping backwards and forwards in time, coupled with the Morlocks own meddling, has resulted in a break down in the space time continuum, one of the practical consequences of this being that time travel in the time machine is now only possible between two points. Although (again, handily for the plot) it has meant that the Morlocks are able to move considerably greater manpower and resources to their past. All this is quite straight-forward; it would seem to be a set up for a story about the conflict between Hocker, his associates and the Morlocks. And it is, sort of. It turns out that Dr Ambrose is actually one Merlin and that in order to save England and the world from the threat of the Morlocks, Hocker must recover the sword Excalibur, which Ambrose/Merlin hides after each threat to England is averted. It is to be recovered by the reincarnation of King Arthur, claimed to be at this time a competent and brave if not particularly distinguished career soldier who has had his consciousness as Arthur reawakened, but is now in a weakened state through the machinations of Merlin’s nemesis. He is teamed with Tafe, a woman from a future England destroyed by the Morlocks who is brave and a little better at coping with the privations suffered by her and Hocker as they attempt to avert the disaster of the Morlock invasion. Her role is, sadly, slightly diminished. Morlock Night is a short novel and there is quite a lot crammed in here. I have to admit that my first thoughts when it was revealed that Ambrose was the legendary Merlin and we were actually seeing an extension of the Arthurian legend was that this is all a little on the silly side. Having finished the novel, I’m not really inclined to amend my position with regard to the premise. However, that’s not to say that it is entirely without worth. It’s far from being a tortuous read; indeed, it was quite good fun. There were some other aspects of it that I did appreciate. Though I don’t think that it quite hits the notes at all times, for the most part it is reasonably convincing as a simulacrum of a Victorian science fiction novel. Further, while I didn’t feel that Jeter had the quite the same intent as did Wells in his novel, he does represent the underground world of the London sewers where (naturally!) the Morlocks have made their base extremely well. While his giving the Morlocks better manners does perhaps blur the lines between them and the Eloi slightly, thus – to my mind anyway – marginally reducing the impact of Wells’ original point about the gulf between the classes. Not entirely and maybe I’m being picky, but Wells certainly had a message in his novel, where Jeter’s feels a little lighter. If complaining that the incorporation of the Arthur legend is a little silly and that the novel lacks some of the weight of the original novel sounds like I hated this, I should say that I did actually quite enjoy reading it. Though perhaps done to death, re-imagining the Arthur legend isn’t inherently a bad thing and when novels dealing with weighty subjects become overly didactic, they become not so much instructive as mind-crushingly tedious. Morlock Night doesn’t outstay its welcome, so though I noted these issues, I wasn’t especially put out by them. I think that, as per my initial reservations about this kind of endeavour, the main problem for me, anyway, is that this novel suffers a little from living up to the source material, where Baxter’s Time Ships perhaps does not. A slightly flawed novel, yes, but not without a certain charm. This entry was posted in Review and tagged k.w. jeter, novel, sf, time travel. Bookmark the permalink.